God called the dry land ‘the earth' and the basin of the water he called ‘the sea'. God saw how good it was." Then God saw how 'good' it was. This rosary is inspired by the simplicity with which the Lord is able to call into being the surface of His creation into dry land and sea, then speak the seeds and plants into being. Just like that! And we take it all for granted! "Then God said, ‘Let the water under the sky be gathered into a single basin, so that the dry land may appear.' And so it happened: the water under the sky was gathered into its basin, and the dry land appeared. God called the dry land ‘the earth' and the basin of the water he called ‘the sea'. God saw how good it was." This rosary is formed by the work of our hands, with the help of the Lord, and with beads that are freshly made! Fine Jasper Pater beads are warm to the touch and have a history of capturing the past. A pleasure to pray! Aves are beautiful to behold, see both sizes below. The crucifix and center are exceptional - cast from antiques in solid bronze or sterling silver. 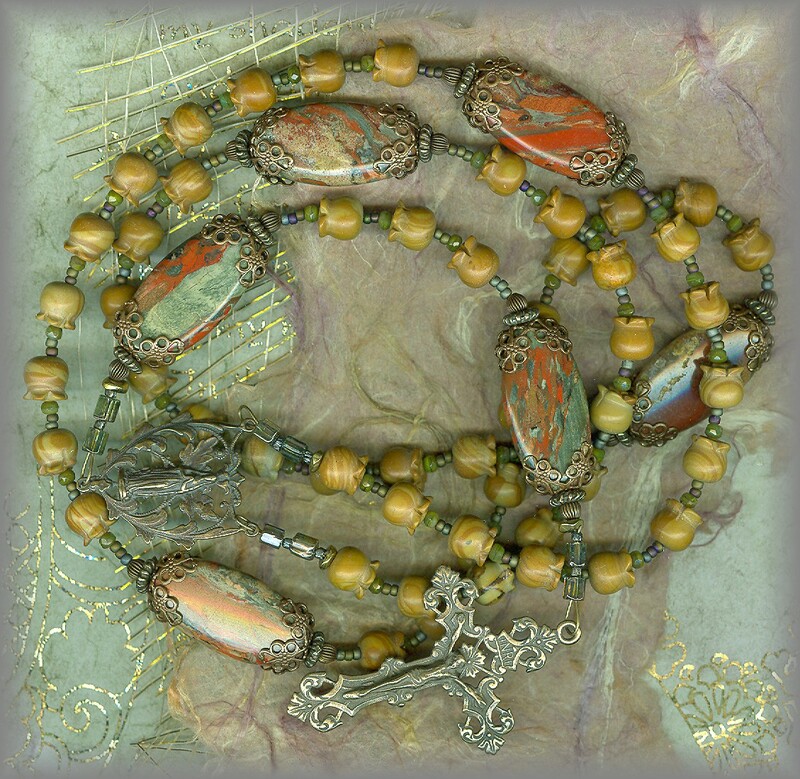 A very wonderful rosary in soft earthy tones, yet very powerful. (pictures do not do them justice) For men or women. 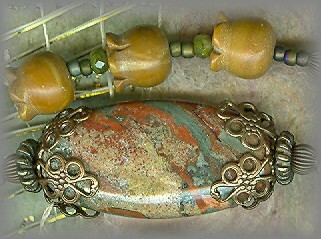 AVE BEADS: Quite incredible to realize these 8 mm Ave beads are carved Jasper tulips. No two alike. These have the little faceted beads on the top of each tulip to give a dew like drop of sparkle. PATERBEADS: Poppy Jasper, no two alike, each like a natural landscape painted by the creator himself! Each framed with an antiqued filigree cap to complete the flat oval Pater. All crucifixes, centers and religious metals are available alone, Each hand cast from vintage and antique pieces in sterling silver and solid bronze then antiqued to restore original patina For full collection, visit SUPPLIES link at top of page. information, pricing or to order click link above.